What happens when you take four of the most popular bands from Texas and Oklahoma and put them on one bill together in markets that aren’t as familiar with them? Well, we’re all about to find out. Randy Rogers Band, Wade Bowen, Stoney LaRue and Josh Abbott just kicked off a tour yesterday that started in Baton Rouge and will wind up in Massachusetts with stops in NYC and DC mixed in. Taking Texas to the masses has been a mantra of this music scene for nearly 20 years. Some have fared well in this venture and others have failed. If you’re on the east coast and rarely get to see this kind of music, go check this tour out. Find out what the buzz is about down here. Can’t wait for next Thursday – such a rare treat for us on the East Coast! Been following all these guys for years! so cool! but I wish Texas got a show with all four too. Traveling from Houston to Nashville to see the show on Saturday. 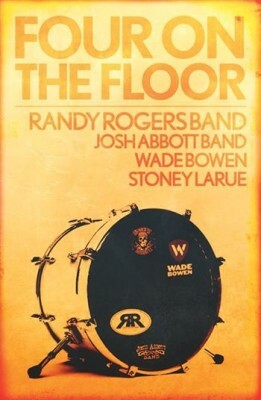 Nashville will get a chance to see/hear what authentic country music sounds like. Can’t wait for the show in Raleigh. This is a year’s worth of shows for us in one night. The Nashville show was amazing. Army uprooted me from Texas and stuck me here – damn good to see/hear some real music! I just want to say I am all new to blogging and seriously savored your web-site. Almost certainly I’m planning to bookmark your site . You absolutely have very good writings. Cheers for sharing with us your web page.